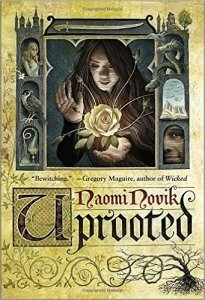 Uprooted, Naomi Novik (Del Rey 978-0-8041-7903-4, $17.00, 440pp, hc) May 2015. Most readers will recognize the furniture in Naomi Novik’s Uprooted. The book is decorated with all of the fantasy paraphernalia we’ve developed during the last several hundred years. There’s a grumpy, caustic wizard in a tower. There are two young girls, one of whom seems to be the chosen one (but isn’t) and one who seems to be the easily forgotten one (but, again, isn’t). There are lessons about being yourself in spite of peer pressure. There’s a deep, dark Wood where bad things happen and a privileged prince, a missing queen, magic, vaguely Eastern European villages, and hearty soups. You’ve read this book a billion times if you’ve read it once. Except, of course, you haven’t. While the individual trees look familiar, Novik’s is a whole new forest. Part of this due to Novik’s mad writing skill. There’s a reason she’s picked up a boatload of award hardware and nominations for her Temeraire series, which started with His Majesty’s Dragon. 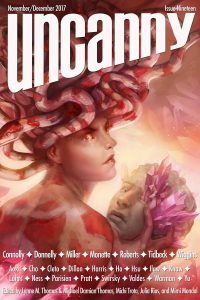 Uprooted’s prose is clear and smart without ever calling attention to itself as being both of those things (which is a lot harder than it looks), the plot is propulsive, and it’s hard to stop reading at just one chapter, simply because you want to know if Agnieszka, our hero, will rescue her friend, or fight the Wood, or even manage to keep her dress marginally clean. And like, say, A Game of Thrones, in Uprooted there’s no guarantee that any given character will make it to the last page, even if they are on the hero’s side. There are real stakes here and it’s hard to predict how it will play out. What really sucked me in, however, are the themes roiling under the surface. While the protagonist fights tree-based evil, Novik talks about gender politics and male privilege in subtle ways. Agnieszka isn’t some super-feminist creation who rides into battle under her Grrrl Power flag as she stabs misogynists in the groin. Instead, there is a subtlety to the negotiations between the powers – both male and female – who see Agnieszka’s quiet magic as less because it a) seems to flow innately from the body of a young girl and b) grows out of the book of an old, never respected crone and of Agnieszka herself. 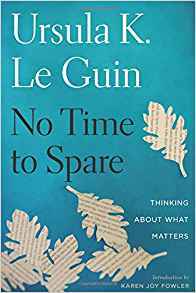 While the plot points are loud, Novik’s subtext is almost gentle, but no less powerful.